Sony's RX100 range has been a hugely popular line of enthusiast compact cameras. Amazon UK has slashed the price for one day only – matching the deal it offered over Black Friday last month. But this is now makes a great Christmas camera deal for anyone still shopping for a great gift. That means you can pick up the excellent Sony RX100 Mark IV compact for just £419 after cashback – that's well under half the original recommended retail price. 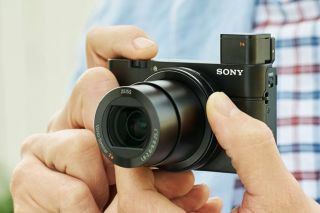 You pay £469, and then get £50 cashback from Sony - The RX100 Mark IV is a feature packed compact boasting 4K video capture, a 1.0-type Sensor, 16fps burst shooting, built-in Wi-Fi and loads more inside a tiny body. Grab the deal here. With a 20.1MP 1in CMOS sensor, the RX100 Mark IV delivers excellent image quality in a body that's tiny enough to slip into any pocket. It boasts a focal range equivalent to 24-70mm range in 35mm terms, and with an f/1.8-2.8 maximum aperture, it's wide enough for low light use. With 4K video capture, electronic viewfinder, optical image stabilisation, 16fps burst shooting, and built-in Wi-Fi and NFC, it's a feature packed compact at a ridiculously good price - and delivers image quality that is among the best you’ll find from a camera of its size.